Model 05106 Wind Monitor is a robust instrument for measuring wind speed and direction in harsh environments. Built for offshore and marine use, the 05106 features special waterproof bearing lubricant and a sealed, heavy-duty cable pigtail in place of the standard junction box. The Wind Speed Monitoring System's design emphasizes simplicity and lightweight construction. Thermoplastic materials offer improved resistance to corrosion from sea air environments and atmospheric pollutants. Pair it with the 26800H Weather Station Display for data display and recording. 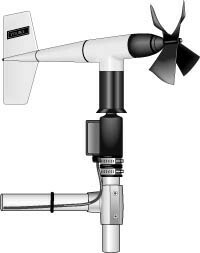 The wind speed monitoring system has a helicoid-shaped, four-blade propeller wind speed sensor. Rotation of the propeller produces an AC sine wave; the frequency is directly proportional to the wind speed. The AC signal is induced in a transducer coil by a six-pole magnet mounted on the propeller shaft. The coil is located on the non-rotating central portion of the main mounting assembly, eliminating the need for slip rings and brushes. This Young Wind Sensor features a potentiometer for wind direction. With the precision excitation voltage from the datalogger applied to the potentiometer element, the output signal is an analog voltage directly proportional to the azimuth angle. Construction of this wind speed monitoring system is of rigid UV-stabilized thermoplastic with stainless steel and anodized aluminum fittings. Propeller shaft bearings and vertical shaft bearings are stainless steel precision-grade ball bearings. The 05106 Young Wind Sensor mounts directly on a 1.0 inch IPS Schedule 40 (1.32 inch O.D.) pipe.